With his champion update headed our way in 7.15, a new bio and a short story for Urgot's are now on his updated Universe page! "Once a powerful Noxian headsman, Urgot was betrayed by the empire for which he had killed so many. Bound in iron chains, he was forced to learn the true meaning of strength in the Dredge—a prison mine deep beneath Zaun. Emerging in a disaster that spread chaos throughout the city, he now casts an imposing shadow over its criminal underworld. Raising his victims on the very chains that once enslaved him, he will purge his new home of the unworthy, making it a crucible of pain. Urgot always believed that he was worthy. As a headsman, an executioner of the weak, he was a living embodiment of the Noxian ideal that strength should rule, making it a reality with every swing of his axe. His pride swelled as the bodies piled ever higher behind him, and his intimidating presence kept countless warbands in line. Even so, a single word was all it took to seal his fate. Sent to distant Zaun to eliminate a supposed conspiracy against the ruler of Noxus, Urgot realized too late the mission was a setup, removing him from the capital even as the usurper Swain seized control of it. Surrounded by agents of the chem-barons, and enraged that everything he believed was a lie, Urgot was dragged down into the chemtech mines beneath Zaun. He was defeated. He was enslaved. He was not worthy after all. He endured the mine’s hellish conditions in grim silence, waiting for death. The mine’s warden, Baron Voss, would sometimes offer freedom in return for a prisoner’s tortured confession—granting it with the edge of her blade. 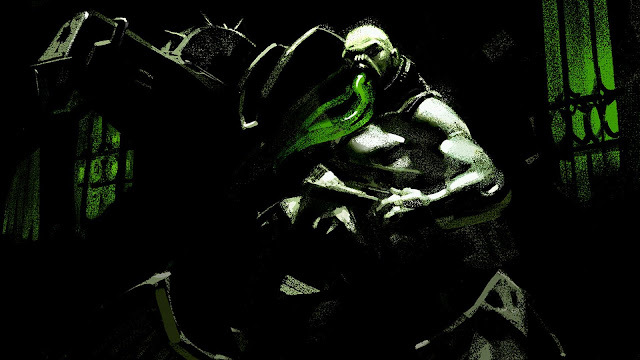 From the screams that echoed through the tunnels, Urgot learned about the wonders of Zaun. There was something special about the city, something marvelous and evident even in the secrets that spilled from slit throats. Urgot didn’t know what it was until he was finally brought before Voss, fearing that she would break him. But as the baron’s blade cut into his flesh, Urgot realized that his body was already wracked with agony, far beyond anything Voss could inflict. The Dredge had made him stronger than he’d ever been as a headsman. Pain was Zaun’s secret. His laughter drove Voss back to the surface, and a reign of anarchy began in the depths. Seizing control of the prison, Urgot reveled in new trials of survival. He found the parts of his body that were weakest, and replaced them with scavenged machinery, technology created by those who would die without it—necessity being the mother of pain. The guards could no longer enter the areas Urgot had carved out of Voss’ grasp. The prisoners themselves were more afraid of their new master than they were of her. Many even grew to hold a fanatical respect for Urgot, as they were forced to hear his feverish sermons on the nature of power, his grip tightening around the necks of those who would not listen. Only when a Noxian agent arrived in the Dredge was Urgot was finally forced to confront his own past. Though the spy recognized him and sought his aid in escaping, Urgot beat him mercilessly, and hurled his broken body into the darkness. It was not strength that ruled Noxus, Urgot now realized, but men… and men were weak. There should be no rulers, no lies, nothing to interfere with the pure chaos of survival. Starting a riot that ignited a chemtech vein within the mine, Urgot shook the city above, and cracked the prison open in an explosion that rivaled the birth of Zaun itself. Many prisoners died, and thousands more disappeared into the Sump beneath the city. But the worthy, as ever, survived. Since then, Urgot’s reign of terror has only grown. A hideous fusion of industrial machinery and Noxian brutality, he slaughters chem-barons and their lackeys one by one, gathering his own following among Zaun’s downtrodden masses. To any who find themselves spared in his murderous rampages, he delivers a message: he is not here to lead, but to survive. If you are worthy, you will survive too. And the trials… they are only just beginning." "We were running through the streets of Zaun. The pipes and stained glass were blurred, smeared colors against the Gray, and the fog that hung in every chem-soaked alley. Zori was to my left, all matted hair and rusty knives—her smile was the only sign that she was beautiful beneath the grime. Blenk was behind her, with a spray-philter full of glowing paint and a head dripping with ideas. Scuzz brought up the rear, every bit the kind of lug you’d expect to be called Scuzz. But he was our Scuzz, every scuzzy bit of him. He yelled our gang’s name into the billowing smoke, marking the night as ours. We laughed, and yelled it too. We were young, we were alive. Nothing could stop us. It would have to catch us first, and we were still running. The city itself seemed to carry us forward as we slid down into its depths, farther and farther from the sump-scrapper we’d just robbed and left bleeding in the gutter. His cogs still jangled in our pockets. More than enough for a bit of fun. We were on our way to the Black Lanes, the market at the heart of Zaun. “That’s what I mean,” Scuzz muttered. And the silence after… It weighed heavier even than Piltover, glittering above us. Pushing slowly into the market through the fog, we found dram-carts overturned, their wheels spinning lazily. Stalls abandoned, still full of exotic wares. There was a stench in the air that reminded me of the sump-scrapper—a stench strong enough to make my eyes water, when even seeing him bleed had not. And there were bodies here, too. Many of them were wearing a chem-baron’s emblem. They’d been torn to pieces, the cobbles red beneath them. It was a hulking shape, with mechanical legs and many guns, fused savagely to its flesh the way a mechanician would fuse two pipes. Burning and searing. Just looking at it made me wince. In one hand, it held a much smaller figure aloft. A man, choking in the chemtech cloud. As he writhed, the monster taunted him, its voice a mechanical buzz vibrating deep in my gut, threatening to loose the bowels within. But the man only writhed, kicking uselessly, growing weaker and weaker—until finally, only his augmented arm still jittered, echoing his last, desperate thoughts. Even after they ceased. And with that flash of brass, it hit me. The dangling corpse, he was a chem-baron, the only kind of person who could afford newfangled kit. Baron Crimson, or somesuch. These were his men, scattered around us. Run. We had to run. I could hear Zori, Blenk and Scuzz panicking and coughing somewhere nearby. I reached out into the swirl for anyone, anything, to pull along with me as I made my escape. But there was only the sound of a body slumping softly to the ground, a spray-philter rattling across the cobbles. Blenk. I stumbled as the truth hit me. He was gone. The monster pushed itself through the cloud, a massive, armored leg slamming down beside me, and then another, and another—all revealed chemtech-filled tubing, and protruding gun muzzles that smoked with the very same heat still smoldering in the bodies around us. I could taste it at the back of my throat, a truth as bitter as the acrid air. I was going to die here. The monster grabbed me by my ragged scruff, lifting me close enough to see its face. It was a visage of terror, all the more horrifying because it was human. More human than the rest of him, at least. His tox-mask glowed as it vented pure alchemy, but his eyes were somehow even brighter. Intelligent. Almost seeming to smile as they took my fear in. “A son of Zaun. What is your name?” he growled as he brought me closer. His accent was sharp, but I couldn’t place it. His words battered my resolve, each one hitting with the force of his hate. I couldn’t even stammer an answer. I closed my eyes against the tears before I could see what had happened to her. “Run!” he bellowed. I saw Zori then, sobbing, reaching out for help with the last of her strength. I didn’t want this to be the way I would remember her. I wanted to remember her smile. I still do. But I was running again, through the streets of Zaun. And can you imagine how it felt to realize, with burning lungs and heaving breaths, that my screams were the message I was to bear? I was alive. My friends were not.